Show general stats for Substance20. I've been developing a shmup on and off during the past year, and only recently did I manage to solidify the mechanics as far as I could. I was hoping to get some extra feedback on it, so here goes nothing. 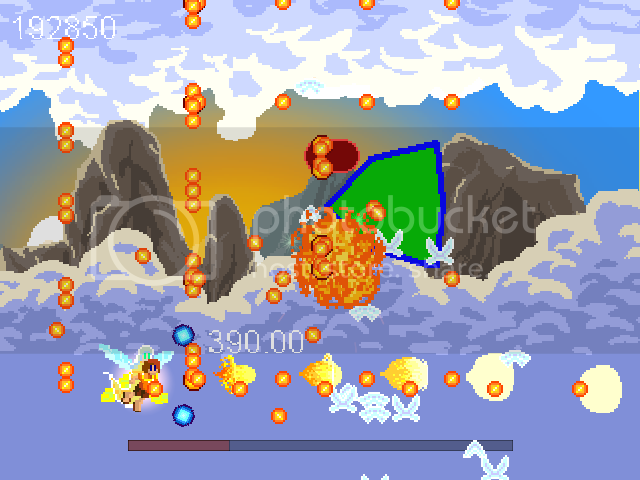 The shmup is entitled "Papilio". I'm not going to narrate the story here, but if anyone's interested, I can put it up here as well. Let's concentrate on the core mechanics. Basically, the game uses a Rock-Paper-Scissors elemental damage system. You have three elemental weapons at your disposal: Fire, Ice and Earth. Fire beats Ice, Ice beats Earth, and Earth beats Fire, in that order. Correspondingly, almost all opponents have these elemental affinities themselves. Following this rock-paper-scissors sequence will enable the player to deal multiplied damage to prone enemies. However, there are additional mechanics to this motif. You will only deal 1/4 of your weapon's original damage output. In addition, your efforts will only serve to POWER UP that opponent. A powered-up opponent will end up shooting more difficult projectile patterns, or gain extra abilities like being able to move faster or warping periodically across the screen. You can power up an enemy twice, from level 1 to level 3. However, a powered-up opponent will end up dropping more point icons for you to collect when killed, as well as weapons and powerups on occasion. Additionally the level in which said opponent was killed acts as a score multiplier. Additionally, as a defensive measure, you can cancel some of that enemy's shots with a same-element weapon. Conversely, by reversing the elemental weakness sequence (i.e. 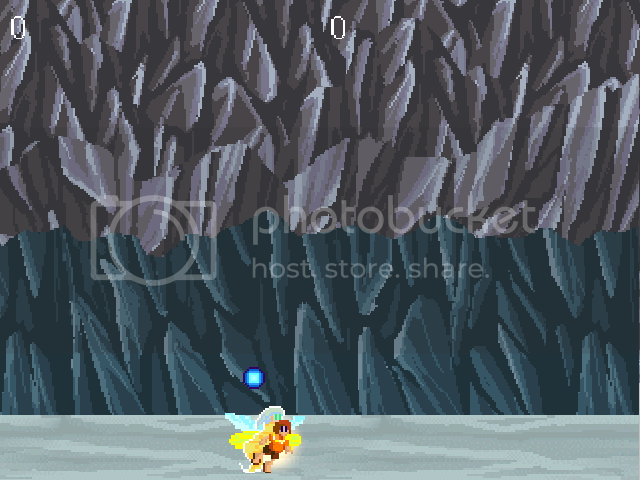 going from Earth > Ice > Fire, in that order), you can actually level down opponents, all the way down to level 0. Weakened opponents fire less shots, move more sluggishly and are generally tamer, but will drop less point icons for the player to pick up, and upon destruction give little to no points. Now, how do you deal with this? The game will allow the player to have only two different elemental weapons at his disposal at any given point, assuming he has picked up said weapons on the fly; otherwise, he's left with a default, non-elemental peashooter. The challenge, then would be to bring the right types of elemental weapons for every scenario. To this end we incorporated a feature that gives the player control over which weapons he wants to carry in the heat of battle. Unlike, say, Raiden, where every new weapon you pick up automatically replaces the one you currently have, in Papilio you must first discard the currently equipped weapon to be able to pick up a new one. IIRC one of the 2k7 winners in here used that mechanic (Varia). Now, a catch-22. Let's say you have a scenario in which the majority of opponents are Fire-based. You are currently carrying a Fire and an Ice weapon. If you shoot your enemies with the Fire weapon, they will level up and grow more powerful; let's assume you want to do just that for points. But the problem is, your OTHER weapon is Ice, which will level them down when they are shot with it. Remember what I said earlier about reversing the elemental weakness cycle? So how do we deal with this? For one, we can discard the Ice weapon and just kill said opponents with the Peashooter. That would work but would take a bit long. However, here's where the elemental combo feature comes in. You can combine two different elemental weapons to create a non-elemental shot, with differing properties depending on which elements were used to create it. So let's say we combine Fire+Ice, which results in a non-elemental high pressure water beam that pierces through multiple targets. First we buff up the enemies, then we use the combo shot. Problem solved. Of course, if we carried 2 of the same elemental weapons with us, we can only create a more powerful version of that element when we use a combo. EDIT: I've decided to post the current control scheme here and explain a few more details as well, in order to clarify some points that might confuse readers. SWITCH BUTTON: switch between weapons; the player can have only 2 elemental weapons at any given time, otherwise possessing only a non-elemental default shot. TOGGLE POWERUP: activate/deactivate optional powerup. The player will be able to pick up icons for special abilities such as shields, weapon boosters, multiples or revolving barriers, all of which are temporary and will run out after prolonged use; however, inseatd of being activated immediately upon pickup, these can be toggled on and off. at the player's whim, enabling him to conserve them for later use. COMBO SHOT: FIRE + SWITCH (requires 2 elemental weapons). Unleashes special non-elemental shots that differ in property depending on which elements the player currently has; otherwise, possessing two of the same elemental weapon will result in a stronger version of that weapon, albeit with different properties as well. BOMB: FIRE + DISCARD (requires currently equipped elemental weapon). Instead of simply discarding the currently equipped weapon, the player sacrifices it to unleash a bomb attack. SUPER BOMB: FIRE + SWITCH + DISCARD (requires 2 elemental weapons). 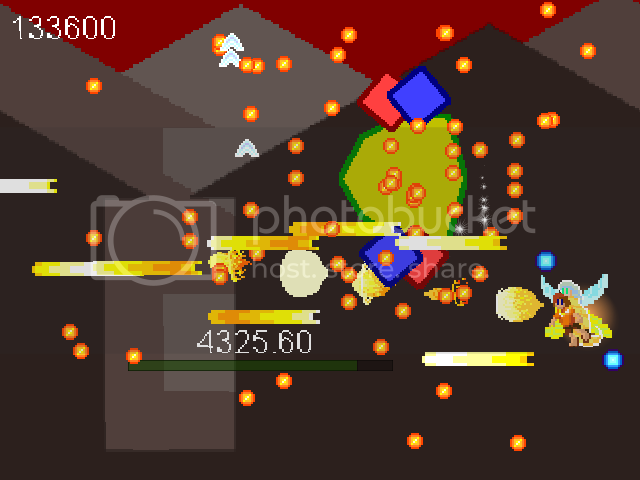 If the player possess two elemental weapons and presses all three buttons, the result is a very powerful bomb with longer duration and more damage than normal bombs; however, it has the side effect of making the player lose both weapons AND being unable to perform any bomb attacks for a long period of time. What do you guys think? The thing I'm quite nervous about is the fact that this game may well be a balancing nightmare in the end. However, the main reason I incorporated this kind of risk-reward scenario is to act as a buffer for casual gamers. Basically you can take the safe route and level down opponents before killing them (or, as a tactical move, semi-neutralize high-level onscreen threats before mopping up the opposition methodically), or you can take the riskier, yet more rewarding route by buffing them up before killing them. that it would enable the player to somehow retrieve the weapon, say, after picking up a different one for temporary use. The player would simply discard the weapon, pick up the new one, use it for as long as he needs, then get rid of it and pick up the old one before it completely floats offscreen. The main problem with this one, admittedly, is the fact that it gives the player an additional thing to worry about in combat. To prevent any unwanted weapon switching. I hated it when I had a gala time destroying things with my fully powered Vulcan and then accidentally pick up the Blue Laser back in Raiden II. In Papilio, unless you discard a weapon you won't be able to pick up any new ones. However, the downside is the fact that you lose your weapon after bombing, which I'm sure players wouldn't want. I'm beginning to think there must be a different way to initialize and enable bomb attacks without having to destroy one of the weapons in your inventory, such as charging a meter or picking/using up bomb icons. 2) Why the added optional powerup? Really, it's simply there to help the player out in a bind if he needs it. However, in all honesty it's beginning to feel a little bit superfluous and a bit of an over-designed concept. 3) Why the need to use button combinations? My response is that, due to the limitations imposed above (mainly the desire to avoid unwanted weapon swapping when coming across new powerups on the field), the best way to implement this scheme AND keep a sense of simplicity would be to make do with what was available in the controls. However, any suggestion to simplify this further will be greatly appreciated. Sounds like an interesting mechanic - however is it simple enough that you have time to think about it while you're playing? 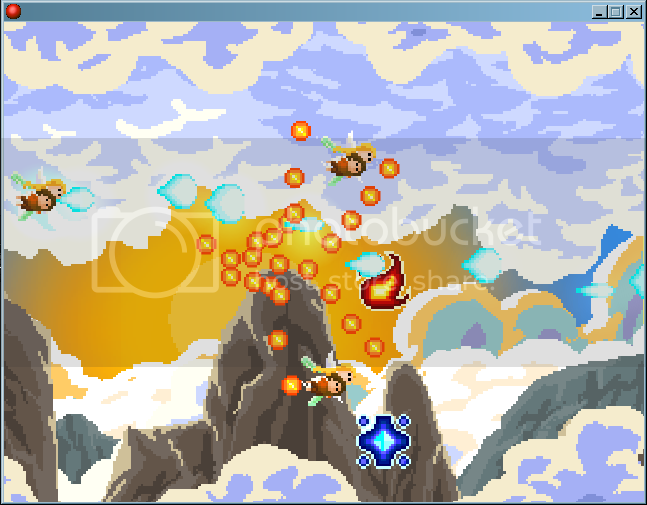 Normally in a shmup you only have time to dodge and return fire, adding more complex elements will require slowing down the gameplay or reducing the enemy shots so that the player has time to think. Have you got any screenshots? It'd help to see the sort of scale and enemy density you're going with to fully understand the game. Thanks for the reply. You're quite correct about the whole idea of pacing in relation to the complexity of gameplay elements. At first this was planned to be yet another danmaku in a stream of danmakus; however, as I refined this mechanic I suddenly realized that for it to work, there must be a significant change in the pacing--something more along the lines of R-Type or Einhander than, say, a Touhou game. Turning it into a bullet hell will quickly become a tedious task requiring months of QA work, as compared to adopting the difficulty curve, memorization and pacing of older games. As the above screenshot shows, the enemy bullet density is still pretty high; it's a carryover from the days when I was so enamored with Progear. I plan to change it soon, though, and make the bullet density flag-dependent. Also, maybe posting the control scheme here would help. I've narrowed it down to a few button presses in order to accomodate as much simplicity as possible. I hope that clears out things...feel free to ask more stuff. The idea shows promise, but this list is perplexing in a number of ways. I would consolidate the main attack as one button for weapon 1 and one button for weapon 2, without explicit "switching" and "combo" commands: the player would be able to tap or hold buttons freely, performing one activity (shooting) twice rather than two completely different ones (shooting and switching). The discard button requires the player to switch to the unwanted weapon, which is probably unpleasant. I would get rid of explicit switching, as explained above; assuming there are three different elemental weapon pickup items that increase the level of the current weapon of the same type or give it to the player if he has less than 2 elemental weapons, discarding can be avoided (fixed weapons for the whole level, other weapon pickups are conserved for future use) or made automatic (for example, if an inactive weapon exceeds the level of the weakest active weapon it replaces it). What sort of complicated powerup needs to be "toggled"? Do you need a dedicated button for extra weapons when the core mechanic of elemental attacks is already rather involved? If you want a charged or otherwise attack variation, a button combination is awkward: link it to the timing of pressing, holding and releasing the regular fire button (or buttons). You can charge shots while not shooting (like in R-Type), shoot differently for held and tapped buttons (like in Dodonpachi), or do something more novel. If you want a bomb, tight timing requirements make a button combination even more awkward than for a special shot; you can have a dedicated button (presumably more important than "toggling powerups") or automatic bomb use. If there are "super bombs", why use regular ones? Maybe you could issue different bombs of about the same power level if the player is shooting each of the different weapons or combinations. I'd like to know more about the large number of different attacks you need to use and their roles. Thanks. Let me break down your comments one by one and see if I can address them. You make a lot of good points, though. The truth is that when this idea was originally conceived, it was far more complicated than its current incarnation, involving things like multiple slots for powerups and whatnot; I had to whittle it down considerably and change a lot of things. In fact some of the things which you brought up about the control scheme were just carryovers from the old version, which I will explain below. Actually, there's no weapon leveling in the game; all weapons are given to you as is. Although, could you please clarify what you meant by "fixed weapons for the whole level"? These powerups are actually just auxiliary abilities you can equip, such as shields, weapon boosters or options, and have little to do with the main weapons system itself. The initial suggestion was to have the player toggle them on and off instead of activating them instantly, in order to allow them to conserve the powerup for later use (as it has limited ammo). I apologize for not explaining this earlier; although, truth be told, I wanted to just get rid of this as it adds one extra facet of input that could otherise be avoided (e.g. by just having these powerups activate upon pickup, or just getting rid of them altogether). This was also considered, however, the mechanic of having to collect and discard weapons at will, as well as its attendant button combination presses (which you did point out above) prevented me from actually incorporating this into the game. Good point. I'll see what can be done about this. Actually, another thing I didn't explain earlier. I think I should revamp the original post and put in everything that I had come up with in order for people to have a better grasp of what I'm saying. Basically, by pressing FIRE and DISCARD, you sacrifice your currently equipped weapon and use it as a bomb. However, by pressing all three buttons (FIRE, DISCARD and SWITCH), assuming you have two elemental weapons you use a super bomb, with longer duration and more damage (but longer cooldown time as well, rendering you unable to use another bomb for a long time). The loophole in this, obviously, is what happens if you try to attempt this using only 1 elemental weapon in your roster. I had considered a charged bomb similar to the one in 19XX. Actually, before I go on and do this, I'd like to thank you for bringing up my biggest woe with my current weapons system. In actuality I'm not fully comfortable with it; a lot of the things you brought up about the complexity of the controls could have been avoided if there were no complicated weapon switching, equipping and storage involved. Additionally, the stored powerup button was a remnant of the original design handed to me, which called for upwards of 8 weapons being stored and manipulated by the player on the fly. Why the need to use button combinations? My response is that, due to the limitations imposed above (mainly the desire to avoid unwanted weapon swapping when coming across new powerups on the field), the best way to implement this scheme AND keep a sense of simplicity would be to make do with what was available in the controls. And the way I did that was by taking advatage of button combos, something I had seen done repeatedly in Treasure games (one inspiration for Papilio, admittedly, is Gunstar Heroes). One alternative to this I had considered is actually a variation of the system you mentioned, which is in turn lifted almost directly from Radiant Silvergun: one button for each weapon. The problem was that I didn't want to remake anything that had already been used, but now it seems this is my only concession, if I am to follow that sort of ease-of-use paradigm (an ironic thing is that the Japanese apparently found that particular control scheme awkward in itself, if what one of the RS reviewers in GameFAQs said holds true!). Although, I have to admit that certain aspects of the current over-design are actually my fault--some of the things in there like charged shots were somewhat of an afterthought on my part, seeing as I wondered "Wait, if players are able to use a combo attack by pressing FIRE and SWITCH together, what would happen if he didn't have ANY elemental weapon equipped?" In hindsight, most of what I had put in there were a result of me adjusting to the existing control scheme. However, before I pass verdict I'll wait for your clarification on the weapon switching mechanic you suggested; it sounds promising, as I definitely don't want the game to be limited to just two elements or people will punish me for knocking off Ikaruga or something--lol. This is because the way the game is designed calls for the player actively managing his weapons on the fly, in order to deal with threats either in the most efficient OR the most rewarding way possible. I purposedly avoided the generic shmup method of having only one weapon and simply shooting down things with it, which seems to be the case with the shmups I see nowadays. I also wanted to avoid a sort of weapon-tier syndrome, in which one weapon or set of weapons will inevitably outpower the rest, as was the case with Thunder Force V. Of course, I'm also avoiding the horrors of Euroshmups at the same time, which is why I whittled down the original 8-weapon selection to only 3. Thanks again for the replies, keep 'em coming. I really need to polish things a lot for this game. Show general stats for Spiderift. I think what he meant by "fixed weapons for the whole level" is that you select your two active weapons before the start of each level, and that's that. With 3 elements, there's not much point in having discards or weapon pickups using that scheme. I agree that separate buttons for the 2 weapons might be a lot easier, but it certainly doesn't fit with the idea of choosing which weapon to discard. Though maybe you could change the very nature of weapon pickups to accommodate this. The weapon pickup could come in the form of a special type of enemy, and the weapon whose last shot you use to kill it gets replaced by the new weapon. I'm not sure about the charged shot idea. It's intention was to give the player an alternative to killing enemies at a high lvl when the only other weapon he has would level it down, right? I got the impression that while using the same-element weapon might level it up, it still does damage (albeit at a lower rate). I think that's part of the challenge though. 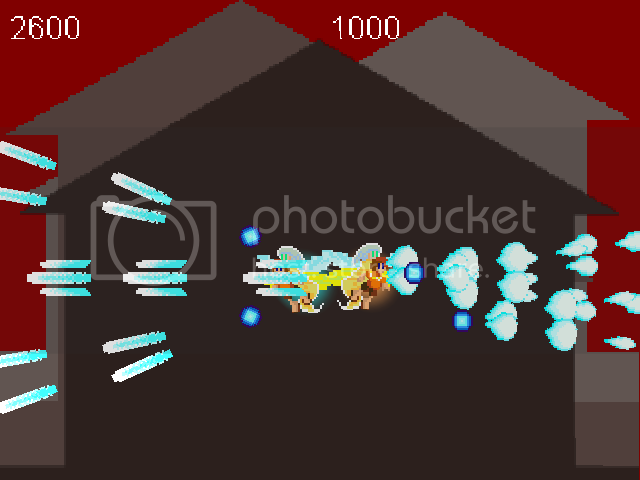 How long would the player be willing to let the enemy live as a high-lvl, spewing out bullet hell, before he decides to use the other weapon to finish it off? Bombs with the 2-button, 2-weapon scheme, mm...maybe have it be hold WEAPON FIRE TO DISCARD and press BOMB to release the regular bomb at the cost of a weapon. But for the super bomb, just press the BOMB button alone. I'm not particularly fond of the toggled powerups idea...they feel kinda tacked on. Though if you are going for a more casual feel, then by all means. While this would indeed simplify gameplay considerably, would it not also serve to reduce the flexibility of weapon handling and hem in the player? The idea behind the weapon switching was actually weapon management strategy. If you've played HALO, you're familiar with the act of discarding and retrieving weapons at will. Players can do this in order to best select which guns to use in upcoming sections of a certain level, which is what I attempted to emulate here in highly simplified form using only 3 elemental weapons. I agree that separate buttons for the 2 weapons might be a lot easier, but it certainly doesn't fit with the idea of choosing which weapon to discard. Exactly, that's the point behind the switching. The key, however, seems to be ease of use, which was what LorenzoGatti was explaining. Anyway, many, MANY thanks for the comments, guys. At this point, though, I think it would better for me to finish the playable demo first and upload it for playtesting, in order to truly clarify what I mean about how the system works. If each level contains all three elemental weapon pickups, in rather large numbers to let the player switch, letting pickups of the same type as a current weapons increase its power is the most obvious way to make them useful. I thought special attacks for a non-combo of two weapons of the same type also implied different power levels and the possibility of powerup items. I'm partial to never switching weapons during levels: there would be less essential pickup items to get (you can add other kinds if you want, especially pure score items that don't cause problems if missed) and the genuine difficulty of facing some parts of the level (of the player's choice) with a "wrong" weapon would replace the repetitive juggling of constantly switching to the rather obvious "right" weapons. But of course it's your game; if you think selecting weapons has to be important, consider that switching weapon with a dedicated button scales much better than separate attack buttons to many weapon types instead of only three. To simplify in a different direction from my previous suggestions, you might get rid of weapon change pickups and combo attacks, which don't seem fundamental, and give the player at least 4 weapon types (the mentioned three elements and the neutral gun, plus possibly other elements and generic guns) and let them switch the single active weapon cyclically among their whole arsenal: extreme weapon choice strategy without the difficulties and error opportunities of discarding and replacing weapons. Like Pokemon attack types, which are many more than three and don't confuse anyone, some attacks would be exceptionally effective, some counterproductive, and some normal with different tactical advantages; you wouldn't be limited by a simple 3+1 elements system. You might even switch element and attack shape (spread, forward, guided missile, lock-on beam...) separately, but the second switching button would cost you the bomb button: maybe it would be too extreme. Regarding bombs, I understand that you plan to make them rechargeable at different rates, rather than the much more common limited stock approach: it would be a possibly annoying constraint (whenever the player wants to bomb, he must refrain from bombing ahead of time and is unable to bomb for a while), and I don't see the advantages. If you only want to make stronger bombs more expensive, you can make them cost different numbers of fine grained bomb stamps rather than all "1 bomb". A fine grained bomb meter can recharge over time (at a constant rate) and/or with pickup items; for example, Battle Garegga has different sizes of fractional bomb items. Of course if there is only one active weapon the bomb type can match that weapon, without the extra complication of normal and large bombs and more importantly without any need for button combinations (except maybe the implicit and harmless one of different bombs when the player is shooting or not). Simpler is better. Pretty much every time regarding shmups. Ugh. A year has passed already? Dang that's long. Anyway, after much critical thinking and analysis, I decided to just throw out the original design and start afresh. Ironic that it took me a whole year to realize you guys were right in the end: simpler is better. I'm sorry for the whole mess. The basis of the new design is to make a game that non-shmup players can pick up and enjoy. I intend to make this game commercial once it's been completed, but in the meantime I plan on completing a 3-level demo before June 2011, Lord willing. 3 of the levels are already in the build along with a working menu, weapon select screen and rudimentary 2-player functionality, but most assets are placeholders and many critical details need more implementation and playtesting. 2 Player gameplay. The sprite for Player 2 has not been created yet. Backgrounds are placeholders for testing parallax scrolling. Note that you can now shoot behind you, a la Deathsmiles. Placeholder boss with lifebar and life count. I'll be getting rid of the bullet hell soon; there's too much bullet hell on the market and people don't like it. Here I'm showcasing the Burst weapon, inspired by GigaWing's Widerstand. I'm ditching the earlier, way-too-complicated powerup scheme for a simpler one reminiscent of Salamander 2 and early Seibu Kaihatsu games. Piercing Laser weapon this time. The lifebar is misplaced. The blue orbs and player characters have different behaviors depending on which attack type you select at the start. Each type has its own distinct weapon substypes, switched around by collecting different-colored powerups. Yup, Seibu Kaihatsu all right. Level 3. No enemies have been implemented yet. This is the first level I explicitly designed tilesets for and will eventually be my prototype level, meant to test out the variable camera scrolling (the red diamond in the middle is the camera object) and 2 player gameplay. I'm aiming to complete this level by the end of January and release the proto for testing. THAT MUSTS TO BE COOL!